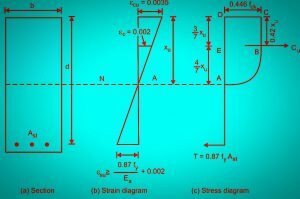 The beam that is longitudinally reinforced only in tension zone, it is known as singly reinforced beam. 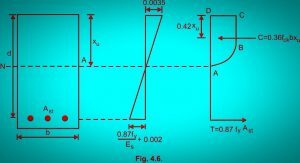 In Such beams, the ultimate bending moment and the tension due to bending are carried by the reinforcement, while the compression is carried by the concrete. Practically, it is not possible to provide reinforcement only in the tension zone, because we need to tie the stirrups. Therefore two rebars are utilized in the compression zone to tie the stirrups and the rebars act as false members just for holding the stirrups. 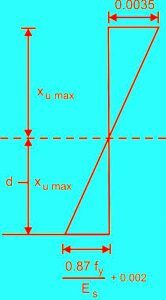 The assumption (1) of the limit state theory gives a linear strain distribution across the cross section as shown in fig (b). It varies as zero at the neutral axis and maximum at the extreme fibres. The stress diagram is shown in fig c.
It has a parabolic shape from A to B and then linear from B to C above the neutral axis. 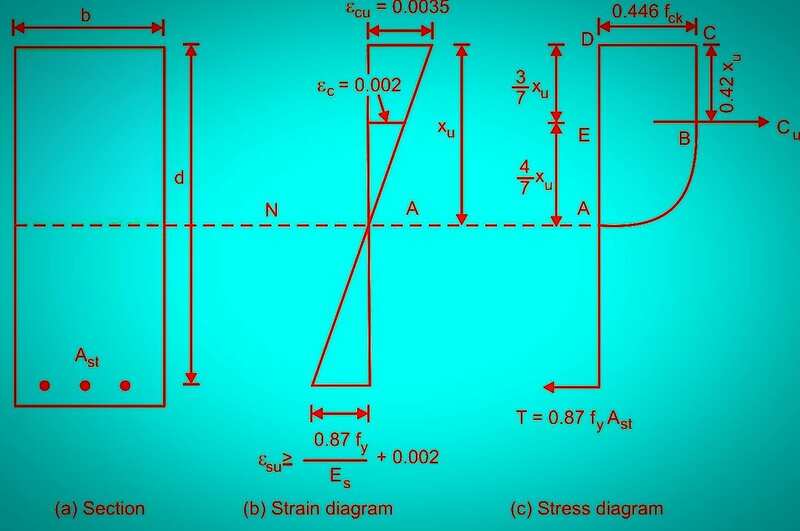 The strain distribution for the singly reinforced beam is shown in fig. The maximum strain in concrete is 0.0035. 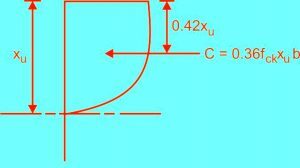 The above equation gives the limiting or maximum values of depth of neutral axis for different grades of steel. 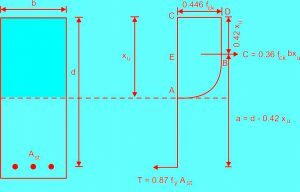 The following table is based upon the above equation and gives limiting values depth of neutral axis for different grades of concrete.